27Aug 27 August. 21st Sunday in O. T.
Thus says the Lord to Shebna, the master of the palace: “I will thrust you from your office, and you will be pulled down from your post. On that day I will call my servant Eliakim son of Hilkiah, and will clothe him with your robe and bind your sash on him. I will commit your authority to his hand, and he shall be a father to the inhabitants of Jerusalem and to the house of Judah. I will place on his shoulder the key of the house of David; he shall open, and no one shall shut; he shall shut, and no one shall open. I will fasten him like a peg in a secure place, and he will become a throne of honor to his ancestral house. O the depth of the riches and wisdom and knowledge of God! How unsearchable are his judgments and how inscrutable his ways! “For who has known the mind of the Lord? Or who has been his counselor?” “Or who has given a gift to him, to receive a gift in return?” For from him and through him and to him are all things. To him be the glory forever. Amen. Jesus answered him, “Blessed are you, Simon son of Jonah! For flesh and blood has not revealed this to you, but my Father in heaven. And I tell you, you are Peter, and on this rock I will build my church, and the gates of Hades will not prevail against it. I will give you the keys of the kingdom of heaven, and whatever you bind on earth will be bound in heaven, and whatever you loose on earth will be loosed in heaven.” Then he sternly ordered the disciples not to tell anyone that he was the Messiah. Above the sanctuary of Saint Peter’s basilica in Rome, in huge lettering of gold mosaic, stands the promise of Jesus to his chief apostle: “You are Peter, and upon this rock I will build my church.. I will give to you the keys of the kingdom of heaven.” These words are taken by Catholics as the basis for the papacy, as applying also to the bishop of Rome as Peter’s successor and chief spokesman for the church’s living faith, holding the “power of the keys”. We shouldn’t be naive or dogmatic in how we interpret those words to St Peter and even more so in how we how we apply them in to his successors. Non-catholic Christians in the Protestant churches do not accept that there is any succession, strictly speaking, to the position of authority held by Peter. More particularly, they see claims to absolute authority for the papacy, under titles like “apostolic jurisdiction” or “the power of the keys” as out of harmony with the Gospel message. They interpret differently what today’s Gospel means for leadership in the Church. We need not insist that the Roman way is the only way of taking Christ’s words. Still, this Gospel deserves close attention for what it says about faith, enlightenment and leadership, and guidance for our own lives. Each must make a personal answer to Our Lord’s question: “Who do you say that I am?’ although Peter’s credo is a solid basis from which to begin. Notice the phrase “Son of the Living God,” expressing more richly what “Christ” means. Peter’s worshipful faith comes to him as gift from above, not from his own ability. Why was the blessing given to him in particular? Perhaps because his humble, contrite spirit made him best prepared to receive it? Or because God chooses whom He wills, irrespective of their merits? It is to this Peter that Jesus entrusts whatever is meant by the keys of the Kingdom of Heaven. Upon his solid, dedicated faith the Church will always rely, for unity and encouragement. Keys are mainly for opening; many doors lock by themselves. We could reflect further on Peter’s task, as seen in other Gospel passages (Mat. 14:28ff; 17:24ff; Lk. 22:32; Jn. 21:15-17), and in the Acts (1:1 5ff, 2: 14ff; 3:1 2ff). What of today’s Church, spread through our world, united under the leadership of pope Francis? How can this work of teaching, encouraging and uniting so many millions of baptised believers be carried on? 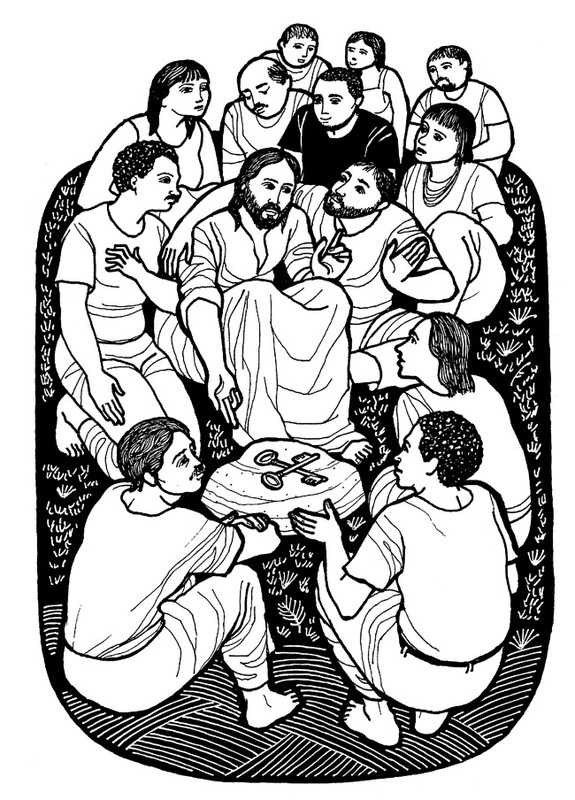 Jesus remains at the centre, as the Christ, Son of the Living God, and he continues to be the Church’s true Rock. We today, just as much as in the time of St Peter, need the ministry of faithful apostles, entrusted by Christ to build up his people, witness to the faith, and provide leadership in Christian love. Pope, bishops, priests and other ministries exist in order to serve. But in some sense, we get the service that we deserve. It is for us to make known to our pastors both our appreciation and our loyal criticisms; especially to pray for them, for their courage and perseverance. Today we particularly remember the present successor of Peter, our Pope; that God may establish him in faith and wisdom; that being strong in himself, he may confirm the brethren; and that as Chief Shepherd he may help us on our way to the Kingdom. The same question is asked of Christians today, «And you, who do you say I am?». Jesus it not asking for a doctrinal statement about his mysterious identity, but also so that we reevaluate our relationship with him. What answer can we give, honestly? Do we make a personal effort to know Jesus, or do we keep him closed up in by our old and worn-out categories? Are we living communities, interested in putting Jesus in the center of our lives and our activities, or are we stuck in routine and mediocrity? Are we learning to look at life as Jesus sees it? Do we look out from our communities upon the needy and marginalized with compassion and responsibility, or do we close ourselves into our celebrations, indifferent to the suffering of the most disabled and forgotten: those who were always the ones especially loved by Jesus? Do we follow him by working together with him in the Father’s humanizing project, or do we keep thinking that the most important part of being Christian is to worry only about our salvation? Are we convinced that the way to follow Jesus is to live each day making life more human and more joy-filled for all? Is our Sunday a celebration of Jesus’ resurrection? Do we believe in the Risen Jesus who walks with us, full of life? Do we go about in our communities welcoming the peace that he left his followers as an inheritance? Do we believe that Jesus loves us with a love that never ends? Do we believe in his renewing power? Do we know how to be witnesses of the mystery of hope that we carry within us? Monica (331-387) was a 4th-century Christian from Hippo near Carthage (Tunisia) and the mother of Saint Augustine. She is honoured for her Christian virtues, her patience with a straying husband, and a prayerful dedication to the conversion of her son, who later wrote extensively about her in his Confessions. Monica followed Augustine to Italy where she found Saint Ambrose in Milan and through him ultimately had the joy of seeing her wayward son convert to Christianity, after seventeen years of resistance. She died at Ostia, on her way back to Africa. This entry was posted on Sunday, August 27th, 2017 at 12:00 am	and is filed under Sunday Resources. You can follow any responses to this entry through the RSS 2.0 feed.Both comments and pings are currently closed. Why do you not clearly say without any fear or trepidation that the Pope is the legitimate successor of Peter and that the Catholic Church is the only one which Jesus left us until eternity??? Our Creed says that it is:ONE HOLY, CATHOLIC AND A P O S T O L I C.
The early church should be grateful, as should the church today, for the character of Peter, as it comes across so clearlly in the Gospels, Acts, and the letters circulated under his name. Peter is modest, down-to-earth, wise, responsible, but open to correction (whether from the Spirit, as in the Cornelius scene, or from Paul in Galatians 2). The most Petrine modern popes in that regard are John XXIII, John Paul I, and Francis. Of course Peter’s paternal and pastoral touch is grounded in rock-like faith in Christ, and other modern popes reflect this. Some of the most beautiful gospel scenes are the dialogues between Jesus and Peter — notably in Luke 5 and Luke 22 and John 21. We might reflect on the wisdom of Jesus is choosing this man to lead his community. On the human level, we must credit Jesus with deep humane understanding of character and of the dynamics of leadership and community. Sorry it’s a bit late, but perhaps the following comments will provide context. You wouldn’t want to have too many of those keys to carry around! Matthew 16: Caesarea Phillippi: The location is significant. Caesar Augustus “gave” the land later now known as Banyas, a principal source of the Jordan, to King Herod, who built a temple to Augustus there. Philip, who succeeded Herod in that region, built his capital city there and named it Caesarea, with the addition of “Phillippi” to distinguish it from other cities of the name. The temple to Augustus no longer exists, but other temples to him do survive. The temple at Pula in Croatia had the inscription: “ROMAE · ET · AVGVSTO · CAESARI · DIVI · F · PATRI · PATRIAE” – “To Roma and Augustus Caesar, son of the deity, father of the fatherland” – a standard inscription, reflecting that on the coins. So Caesarea Phillipi was an imposing reminder of Augustus as son of god – the god Julius, who was dead. When Peter says, “You are the Christ, the Son of the living God,” this is not just a statement of faith. It is also a highly political (and dangerously treasonous) statement, the import heightened by the location. Desmond Tutu said: “When people say that the Bible and politics don’t mix, I ask them which Bible they are reading”. Poverty, violence, sexism, racism, social justice, etc. are not merely political problems, they are spiritual and moral issues. For those who recognise Jesus as the Christ, son of the living God, this influences every aspect of our lives. Do we not also see Jesus (See link) in His humanity walking the ‘Way’ responding in honesty/humility to the promptings of the Spirit His own “Essence” as Peter did walking the ‘Way’ through the promptings of “The gift” of the Holy Spirit? I remember my classmate Paul O’Higgins referring to the Spirit as the “distilled essence of Jesus” and Msgr Francis Cremin saying he’d heard many recondite theological theses but never that the Spirit was the essence of Jesus. It’s true that the Paschal Christ is a “life-giving Spirit” (1 Cor. 15:45); “the Lord is the Spirit” (2 Cor. 3:17). The relation between the pre-Paschal Jesus and the Spirit is different. Jesus is “driven out” into the wilderness by the Spirit in Mark 1:12, and one can certainly see him as learning from promptings of the Spirit.